However, even with all this combined, $3.4bn seems like a hefty price to pay, albeit a price that will likely set both industry valuations, and other acquirable mid-tier service provider hearts’ racing. Not only that, competitors with banking pedigree, such as Capgemini, Cognizant, DXC and IBM will not welcome a stronger Atos being welcomed to the dance at a time when competition is already reaching a cut-throat breaking point. We haven’t seen any meaty M&A in IT Services for over two years... So why now? We’ve been predicting an increase in merger and acquisition activity across the business process and IT outsourcing space for some time, but these IT services monster marriages are like London buses – you wait ages for yours to arrive, and suddenly several appear right behind it. To this end, the only real action of late has come in the call center realm with the feasting of Teleperformance on Intelenet and Concentrix on Convergys. Not since the dinosaur mating noises of HPE and CSC in 2016, or Capgemini’s nuptials with IGATE in 2015, have we had anything much to chew on in IT services bar lots of digital agencies being round up for slaughter. Let’s be realistic, there really aren’t too many “heritage” mid-sized offshore-centric IT services providers left in existence which can get you an immediate seat at the adults’ services table, which explains Syntel’s fantastically lucrative exit, and the disappointment of several other suitors which had been eying picking the firm up on the cheap for several years. Moreover, providers like Atos are feeling the pressure like never before to force their way forward in terms of growth and breadth of offerings and believe the pressure point has been reached and it’s time to act. A drought in traditional client wins for some firms is literally pushing them to acquire as a way to drive market share. The IT services industry is no stranger to firms buying out rivals to gain short-term respite from the market in the face of poor market performance – buying time to regroup/transformation, an injection of new clients and scale. Atos’ recent announcement of its intentions to acquire Syntel has already set tongues wagging in the industry, but before we get caught up in the inescapable hype, let's dig into the facts! It’s hard not to get lost in the number of zeroes in this deal and, frankly, the price tag has left us all scratching our heads a little. At a recent press conference, an investment analyst asked whether Syntel was happy with the deal…why wouldn’t they be? And it’s this sort of seller's market that’s getting a lot of the mid-tier firm’s excited about a potential takeover from a major firm in the space. “Everyone’s up for sale” proclaimed the CEO of the of the leading service providers recently in a private conversation. With some of the world’s biggest IT services firms looking to shore up revenues, capabilities, and access to clients, a lot of firm’s are adjusting pricing expectations, setting the bar far higher than they would have a few years. And the market is undeniably tough right now, and many firms are struggling to find their way. Recently, brighter horizons have been on the cards for some firms as the HFS Digital tipping point theory started to yield results, with enterprises investing in technology to drive their transformation ambitions. But the same theory argued that many firms would struggle to pivot their business models and offerings to meet the changing demands of the market. In this winner takes all market, it stands to reason that firms will shore up their capabilities through acquisition, at the same time that smaller firms that struggle to gain market traction become more attracted to the idea of a buyout. Is chasing a “$250m a year synergy target” realistic, or just merger charm? But, according to Atos, the hefty price tag is supported by some strong arithmetic. The firm stands to gain access to a lot in the deal, including strong long-term banking and financial services engagements and a decent launchpad into North America – a geography the firm has struggled to position itself in from its European stronghold – in spite of its 2014 acquisition from Xerox. But let’s start with what the firm has championed as the main selling point to investors, a $250m boost to annual revenues by 2021 from the synergy of the two firms. On the face of it, this seems a challenging target to hit. 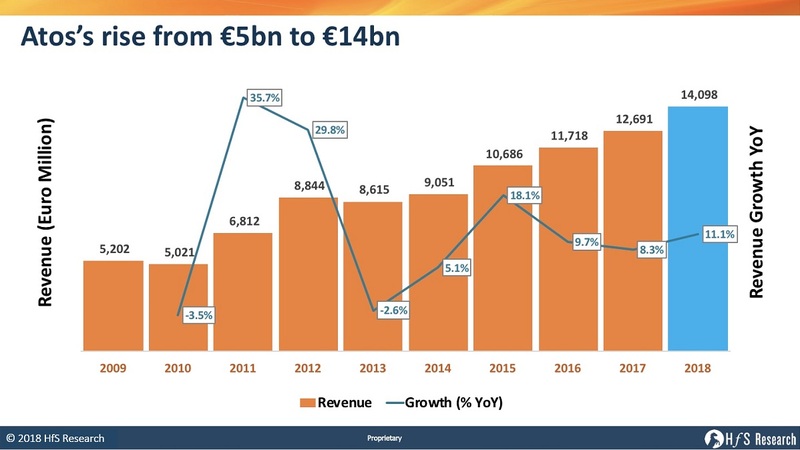 Revenues in Europe have been hit just as hard as everywhere else in the IT Services space, more so in Atos’ strongest line – infrastructure and enterprise cloud. And Syntel’s revenue growth has disappointed financial analysts for years – even if its operating margin is aspirational to many. If the firm can export Syntel’s processes and embed them across Atos, it may stand to drive greater operating margins. Moreover, if it can leverage Atos’ Syntbots RPA technology in new and existing engagements, it could drive out some serious costs. But an increase of $250m a year is perhaps a little more ambitious than the numbers can accommodate. Even with Atos assuring investors that if its current bookings stay put, it should be more than capable of reaching its objectives. The real motivation behind the price tag is likely to be tapping into Syntel’s existing client base and cross-selling between the two firms. In the current market, where new deals are few and far between, the adage of ‘if you can’t beat them, join them’ has never been truer. For the princely sum of a few billion dollars, Atos has gained access to some major financial institutions and enterprises that Syntel has managed to keep on its books for years (over 30 years in some cases). And many of these are big spenders, Syntel is always pleased to mentions that it has grown a handful of its clients to build out up to half of its overall revenues. However, the challenge for Atos is to keep these clients happy. We’ve chewed over the pitfalls of some of the major M&A activities in recent research. And in many cases, these clients may be even tougher to please. Syntel’s ‘customer for life’ no questions asked approach has built a fervent loyalty among its client base – while its too early to say now, the sentiment from this client base may prove to be less than enamored with the recent announcement than either Syntel or Atos are willing to admit. It is also worth pointing out that the oft-stated criticism of Syntel has been its overexposure to a small handful of large clients, should one get acquired or kick them out. However, with a massive new owner in Atos, surely there is now some air cover from this long-discussed risk. A nice deal for Syntel's shareholders, but what’s in it for the clients? As usual, the bit that’s often missed from the narrative when a big deal like this rears its head is ‘what’s in it for clients of both firms?’ At an early stage like this, we can only be speculative, but there are a few things that enterprise clients of both firms should be cautious and excited about. First of all, for Atos clients, there is the opportunity to get your hands on some real RPA capabilities. Atos has struggled over the past few years to find its place in the market, but Syntel has positioned itself nicely with Syntbots – an intelligent automation platform that while lacking some of the bells and whistles of the others has proven itself time and time again to be a solid cost-reducer. Existing financial services clients can also look forward to more verticalized expertise, and a stronger proof-point around delivery as Syntel brings in its considerable experience to engagements. Finally, Atos’ multinational clients can consider leveraging some of Syntel’s North American and Indian delivery capabilities to expand engagements or move work closer to home or further offshore dependent on the circumstances. For Syntel clients, it’s a different kettle of fish. Foremost on their mind must be the protection of the partnership culture they have become accustomed to. That’s not to say Atos is miles from the culture of Syntel, but long-term partnerships have been the building block of the mid-tier firm since its inception and may be a tough hurdle to overcome after the firm’s combine. But they can expect some of the benefits that the firm will bring, such as strong credentials in the enterprise cloud space, and the scalable heft that a larger provider can offer over mid-tier players. Ultimately, there’s a lot of areas where the two firms can create synergy, and cross-sell offerings into each others client bases. But there’s also a huge amount of risk that this engagement is akin to the appetite of the day, which is to stop trying to outbid rivals for engagements and simply buy up rivals. In some of these engagements, clients may come out on top, with access to more experienced and capable delivery partners – but equally, they could lose out on the cultural alignment, and agility that they looked for in a smaller partner. 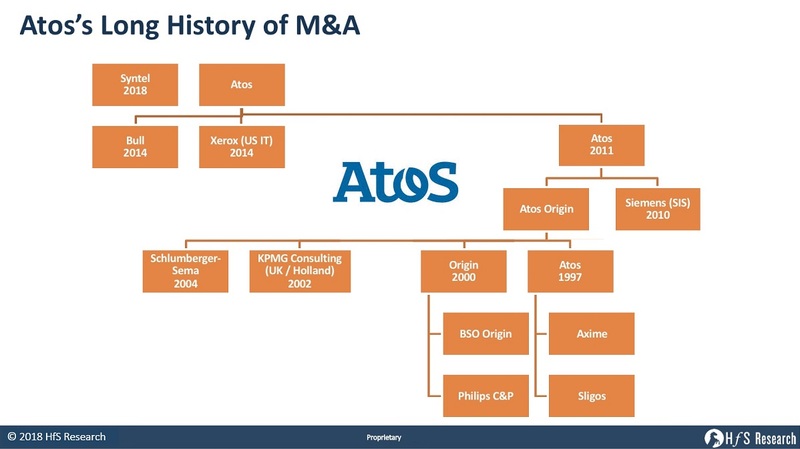 However, Atos management has a historically strong track record for acquiring and integrating business in both the long and medium term. The firms have a long history of large acquisitions across borders and huge integration challenges, starting with Origin in 2000. Plus we see relatively successful integrations of Siemens Business Services back in 2010, Bull and Xerox IT Services in 2014. Indeed you can trace it’s acquiring prowess back to decent purchases of SchlumbergerSema in 2004 and UK and Dutch KPMG Consulting business in 2002. The issue as ever for successful acquisition is making the most of synergy – so that the whole organization is greater than the sum of its parts. This is always a hard trick to bring off measured financially, by the value it can deliver clients and increasingly important, culturally. If the financial boost is only $250m on a $3.4B investment let’s hope gains in the last two are worth it. What does this say about future mid-tier IT services acquisitions? Hexaware – possible price tag $1.50 / $1.25bn: Hexaware is gaining ground quickly and building a narrative that seems to resonate well with clients – however the firm remains small enough for some of the bigger players to see it as a valuable route to inorganic growth. Has good hybrid BPO and IT capabilities, a strong specialization in HR Tech and promising potential in RPA services. Mindtree - possible price tag $1.75 / $2.25bn: Mindtree has had a scratchy few quarters at the start of 2017, but since then have posted rapidly improving revenue growth – over 20% in Q2 2018. The firm’s strong digital offerings make the firm a good prospect for bigger firms looking to shore up capabilities as well as build out market share. Has managed to make a strong shift from BI and analytics to adding digital prowess and has a capable suite of offerings and loyal clients to boot. Mphasis - possible price tag $2.25 / $2.75bn: Has made a strong market impact since freeing itself from a decade-long HP hell... plus CEO Nitin Rakesh is credited a lot for his fine work at Syntel, getting the place in better shape financially. Strong financial services presences could make this firm the next IGATE/Syntel-esque pick up. Virtusa Corporation - possible price tag $2.00 / $2.50bn: Virtusa’s strong consulting background – gained from the acquisition of Polaris – puts this firm as a valid target for large providers looking to build up talent and onshore delivery capabilities in North America. Very strong offshore business built from the ground up by the irrepressible Kris Canakeratne, with deep presence in insurance IT. There are some similarities to IGATE acquisition by CG. Atos leadership has some IGATE DNA now ???? Out on a Limb: Cultural Issues will quickly become the dominant issue, e.g., positive words are used sparingly in France, and criticism is provided more strongly. Another would be the pace of IT in the USA, and need and expectation around responsive answers from leadership even on weekends. At end of the day, IT Services is still a people businesses...and the assets walk out the door every evening. Now the hard work starts! With proper focus on integration and blending the strength of these organizations, Atos will absolutely be at the adult table! I personally think silly season is an accurate description but when the goods on the shelves for purchase get scarce silliness becomes more rampant.